I sat at my desk last week pondering how I would make a portrait of my dear friend Austin Dhillon. See, I had been Austin for Art House’s Portrait Project. The project gave each participant the name of another participant with the instruction to make a portrait of this subject. We were discouraged from having contact with our subjects, the intention being that the portrait would be a complete surprise. Since I already knew my subject, I ended up bending the rules a bit. I requested he send me an assortment of images he liked. I collaged them together to create a bizarre, jumbled piece that he admitted did describe him well. While it was exciting to see my contribution displayed with everyone else’s, my strongest impression upon seeing the works was an awe for how divergent each of our definitions of “portrait” were, and how each definition produced had an equally effective and powerful impact. 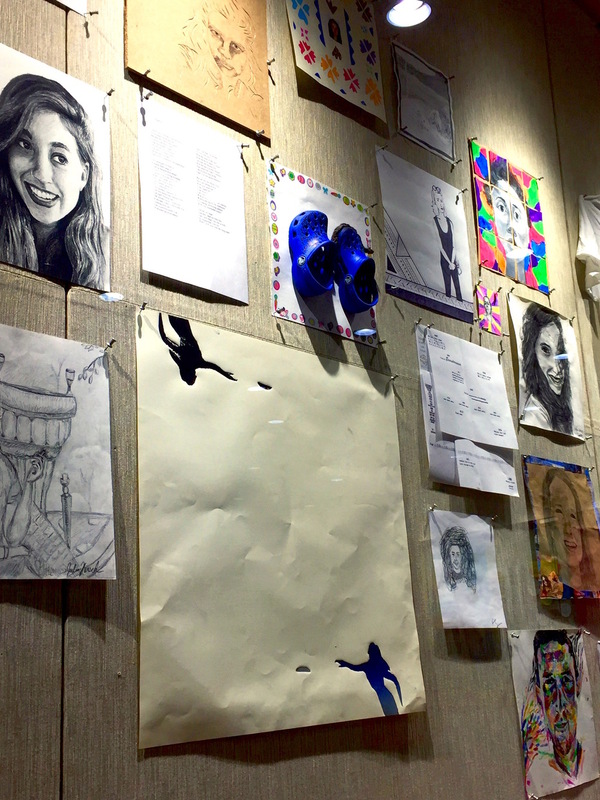 Now on display in Usdan, the collection of portraits is a diverse amalgamation of student talent and personality. The pieces range from life-like sketch to minimalist cut-paper to T-shirt print. It is a testament to both participants’ creativity and to the freedom that the term “portrait” enacts. In fact, it got me thinking about the word itself and its implications, so I took to the Internet to find out a little more on the history of portraiture and the meaning of the word in various contexts. Since ancient eras, portraits have been used to communicate power and status, and it wasn’t until the nineteenth century that portrait subjects become less elite. It goes without saying that by now anyone can be the subject of a portrait, and the collection is indicative of how liberally the term is applied in modern culture. Collage is involved in a lot of the works, echoing the sentiment that our personalities consist of little pieces that work together to make us who we are. The most dimensional is one consisting of a pair of baby Crocs glued to paper, one with a head of hair wrapped around the top as if the toe were a face. The other Croc bears a note written in black marker. Another portrait is spliced into rectangles that made it look like a mosaic. One of my personal favorites is a wearable portrait – a white T-shirt with a neon pink mask-like face printed onto it. Possibly the most unique and intriguing piece is titled “A Graphic Score of Lara Hetzel.” It consists of a list of instruments, ranging from the conventional (violin, cello, bells) to the unconventional (radio, hammer, eye dropper, rock), and, in a manner reminiscent of John Cage, indicates what to play at specific time marks. The artist uses various forms of notation: A list of notes for the bells, a piece of musical scale for the violin, and specific instructions of what channel and volume to adjust the radio to. The portrait project struck me as an exploration of lenses. Each artist created an image of their subject as perceived through a specific lens. By choosing an accessible medium through which they felt they could communicate powerfully, and using it to express their subject, the portrait expresses the subject as seen through the artist’s eyes. It’s a study in perspective, as well as a statement about how we perceive one another. Whether anticipated or unanticipated, it’s also an exploration of social media: Since a lot of the artists didn’t know their subjects, they used photos from their Facebook accounts to create the portraits, adding another layer of perception to the equation. The Portrait Project’s thought-provoking collection of portraits is also enjoyable from a purely aesthetic viewpoint, both addressing existential ideas about depiction and displaying playful, creative images of our community.